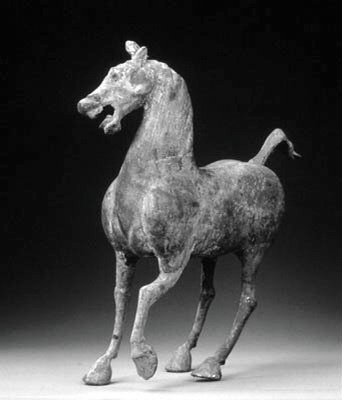 Below is is a horse figurine of the Ferghana, the “Heavenly Horse” of the Western Han Dynasty, China. These “divine” horses were so desirable to the Chinese that they sent two armies over 10,000 km and fought a war with the rulers of Ferghana, Bactria in attempts to obtain them. Historians called this war “the first war ever fought over horses”. Eventually the Chinese obtained their heavenly horses from the Wusun and later from Ferghana a.k.a. Dayuan. These were the finest mounts known and the oldest breed of purebred or thoroughbred horses. 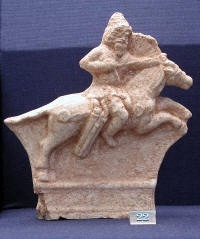 The Parthians coveted them, knowing them as the Great Horse of the Persians. There are really two breeds of heavenly horses that the Chinese returned with from Ferghana to China – the Parthian or Persian horse, and the Akhal Teke which is a Scythian horse. “One thing the Parthians did not adopt from the Scythians was their horse. The Scythians used several breeds of horse with the golden Akhal-Teke being their preferred mount. Their obsession with golden colored horses resulted in a large number of golden chestnuts and golden bays being found among the tribes and in the Scythian ice tombs. … The Medes, a relative of the Parthians, raised this animal. But the Akhal-Teke, while possessing great endurance and some speed, was not as fast as the Parthians wanted. The Great Horse of the Persians was the mount they chose. A magnificent animal that came in all colors, including the highly desired palomino and appaloosa, was fast and strong and beautiful. He was also the ultimate riding horse, occasionally producing gaited animals that were highly sought after by everybody from China to Roman Spain. In the Western Han Dynasty, Emperor Wudi (141-87 BC) started to pursue an aggressive strategy to expel the Huns from China. During the early campaigns, the emperor found out that his slower troops had no match to the Hun horsemen in the open terrain beyond the Great Wall. To build up a mobile force, he sought for more horses and, importantly, for swifter horses. He thus sent envoys to Bactria to buy breeding stocks of Turkestan and Fergana. The horse trade flourished between the Central Asian nations and the Han Dynasty for several years. Then, the ruler of Fergana killed an envoy of Emperor Wudi and suspended the trade. In 104 BC, Wudi sent a large expedition force of over 40,000 soldiers to Fergana to take the needed horses by force. In the end the Han’s army obtained several thousands of horses. Among these horses, there was a herd of tall fine horses that were known as Heavenly Horses and excreted bloody colour sweat or bloody sweat. This puzzling phenomenon was often seen on the shoulder and the back of the Fergana horses. One easy answer might be the sweat mixed with the blood from saddle sores or caused by a heavy saddle. Now, the scientists have unanimously agreed to a consensus that the bleeding is caused by a subcutaneous parasite on the skin of the upper body of the horse. Merchants during the Han dynasty(see bottom left, Western Han horse rider, Cernushi Museum, Source: Wikiwand) did a brisk trade on the Silk Road, those who traded in salt and iron were wealthy and often owned huge tracts of land, and became persecuted by Emperor Gaozu (Source: Society and culture of the Han dynasty). The merchants of the states of Kaya did a brisk trade in iron, Silla in gold metalwork items(see bottom right image, of a Silla dynasty merchant, source: Military.wikia.com), and Japan in salt during the age. Poetry and music flourished during the Zhou dynasty (1045-22 BC) – the age of Confucius – and bronzes were made with elaborate inscriptions. Intricate, interlacing patterns were used to represent animal forms. Bronze “spade” money appeared in the Warring States period (480-22 BC) and the rich adorned their furniture and carriages with bronze fittings inlaid with fold, silver and malachite. The fashion had an effect on ceramics as artisans tried to replicate bronze shapes and patinas. Han vases are exquisite in their magnificent reddish brown and deep green glazes. During the Han dynasty (202 BC – 220 AD) pottery figures of dancers and court musicians and amber-glazed hill jars were produced. 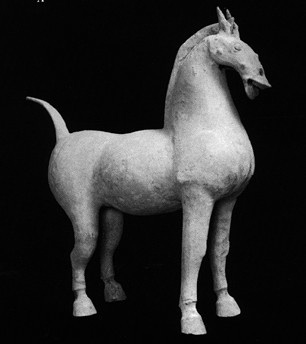 The fascination with horses in Han culture resulted in a varied of pottery horse figures, both glazed and unglazed, with detailed painting to reveal saddles, saddlecloths, reins, and trappings. In 439, north China came under the rule of the To[u]ba Wei. During this period, Buddhism profoundly influenced Chinese culture and art, and Buddhist stone sculpture and painting flourished. 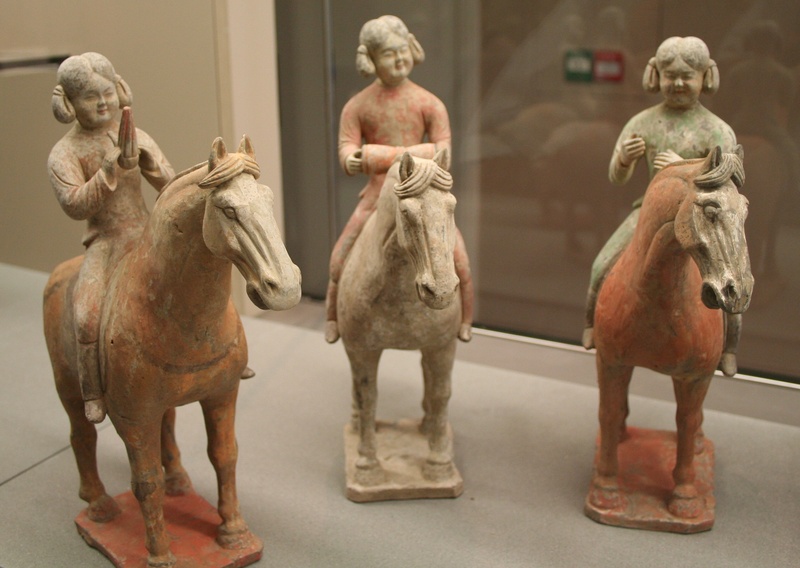 Some of the best ceramic grave figurines have an almost fairy-like elegance, while the horses are no longer the tough, stocky, deep-chested creatures of Han art; they exhibit a heraldic grace of form. The Northern and southern dynasties (429-589) and the Sui dynasty (581-618) set the stage for the glorious period in Chinese arts that would be the Tang dynasty. While the Sui dynasty was short lived, the ceramics produced in these years are prized among collectors. It is worth comparing Sui horses, with their heavy bodies and long tails, to the highly stylised form of Tang horses. Chinese culture prospered during the Tang dynasty (618-907). People appeared to prize the famous Tang horses and their riders depicted in a wide variety of shapes and poses. Tang artists made the horses look like they were flying, prancing, the horses had perk tails, raised legs and bent heads and other poses. Riders were also depicted from foreign Hun riders to court officials, wealthy, leisurely ladies and traders to foreigners with beards. Representation of the extensive trade along the Silk Road is found in beautifully crafted camel figurines. Tang craftsmen also perfected horses and camels in Sancai glaze (three colours). “…Each dynasty has a unique style of production. Knowledge of the historical development of firing and glazing techniques gives even the novice the means to identify Chinese ceramics. For example, the earliest Chinese pottery is the unglazed earthenware of the Neolithic culture of northern China, produced in the early part of the second millennium BC. Neolithic pottery displays striking beauty in its primitive geometric painted designs, which are remarkably similar to works produced much later by the Navajo tribe in the southwest of the North American continent. The Shang dynasty (1750-1045 BC) saw the introduction of glazing, but the period is best known for the beautiful bronze vessels illustrate the power and vitality of this epoch in Chinese history. They range in height from a few inches to more than four feet and are valued for their short inscriptions. Poetry and music flourished during the Zhou dynasty (1045-22 BC) – the age of Confucius – and bronzes were made with elaborate inscriptions. Intricate, interlacing patterns were used to represent animal forms. Bronze “spade” money appeared in the Warring States period (480-22 BC) and the rich adorned their furniture and carriages with bronze fittings inlaid with fold, silver and malachite. The fashion had an effect on ceramics as artisans tried to replicate bronze shapes and patinas. Han vases are exquisite in their magnificent reddish brown and deep green glazes. During the Han dynasty (202 BC – 220 AD) pottery figures of dancers and court musicians and amber-glazed hill jars were produced. 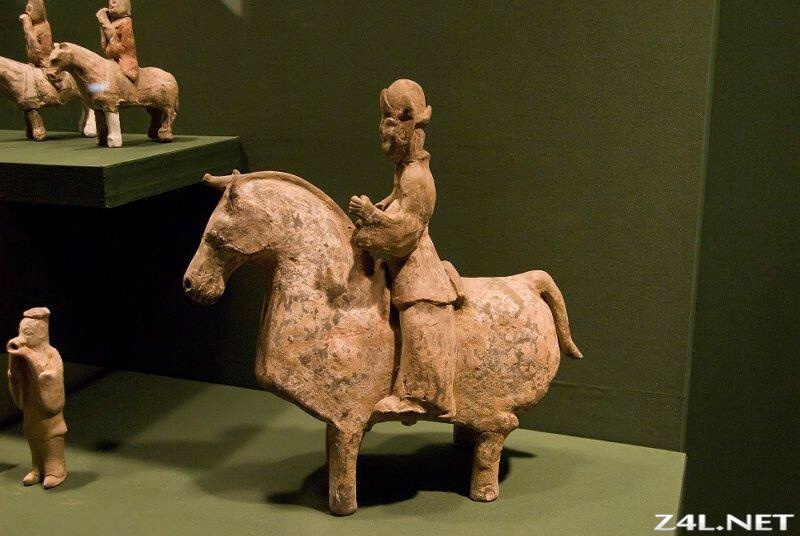 The fascination with horses in Han culture resulted in a varied of pottery horse figures, both glazed and unglazed, with detailed painting to reveal saddles, saddlecloths, reins, and trappings. The Northern and southern dynasties (429-589) and the Sui dynasty (581-618) set the stage for the glorious period in Chinese arts that would be the Tang dynasty. While the Sui dynasty was short lived, the ceramics produced in these years are prized among collectors. It is worth comparing Sui horses, with their heavy bodies and long tails, to the highly stylized form of Tang horses. Chinese Han culture expanded during the Tang dynasty (618-907). The famous Tang horses and their riders come in a wide variety of shapes and poses. Tang artists ably captured the movement of the beasts, portraying gaping mouths, extended tails, raised legs and bent heads. Riders run the gamut from court officials and traders to foreigners with beards. Representation of the extensive trade along the Silk Road is found in beautifully crafted camel figurines. Tang craftsmen also perfected horses and camels in Sancai glaze (three colours). [Comment: The hairstyle suggests Hunnic or Eastern Scythian/Saka and is similar to that seen in the haniwa funerary ceramics of the tumuli of Kofun Japan. Strong trade and cultural connections are known to have been established between the two peoples as many of the early Buddhist bronze statues of Wa and Yamato Japan are in the Wei style and early bronze mirrors of the tumuli were Wei mirrors. Following the fall of the Jin dynasty, China was in a state of chaos during the wars and divisions of the Sixteen Kingdoms period when the Jin lost territory to the five Wu Hu “Five Barbarian Tribes” during the Northern Wei dynasty period, until the arrival of the Xianbei tribes displaced the Wu Hu tribes. As the Xianbi or Xianbei tribes are genetically similar to Koreans, presenting possibly one of the ancestral populations of Koreans of the same period, this may explain the similarity of Northern Wei figurines to those of the Korean Three Kingdoms as well as Japanese haniwa of the Kofun period. Japanese horse haniwa clay figurines are regarded by most scholars to be traditions brought by early Korean immigrants from Gaya / Kaya or Silla. The origin of horse bells possibly began somewhere on the ancient tea road where the sound of bells was not only a practical safety measure, warning people on the roads but also touting the arrival of traders and their wares; traders must see The ancient tea-and-horse Silk Road . Walked out of the tent as if nothing was happening. Parents asked–Why’s the dog barking ? Just the animals coming back to the village, said 1. Parents asked—Who were you talking to? Just to the larks flying over the sky, said I. For thousands of years, there was an ancient road treaded by human feet and horse hoofs in the mountains of Southwest China, bridging the Chinese hinterland and the Qinghai-Tibet Plateau. Along the unpaved and often rugged road, tea, salt and sugar flowed into Tibet, while horses, cows, furs, musk and other local products came out. 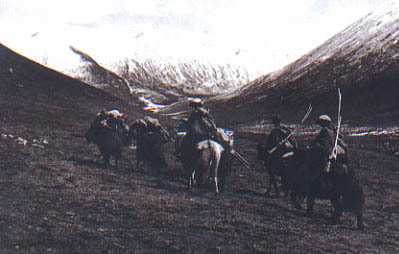 The ancient commercial passage, dubbed the “Ancient Tea-Horse Road”, first appeared during the Tang Dynasty (618-907), and lasted until the 1960s when Tibetan highways were constructed. Meanwhile, the road also promoted exchanges in culture, religion and ethnic migration, resembling the refulgence of the Silk Road. The road stretched across more than 4,000 kilometers mainly in Southwest China’s Sichuan and Yunnan provinces and the Tibetan Autonomous Region. Just as the Silk Road, the Ancient Tea-Horse Road disappeared with the dawn of modern civilization, but both routes have played very important roles in the development of China. Different Chinese ethnic cultures, such as the Dai, Yi, Han, Bai, Naxi and Tibetans, have met, fused and developed along the historic road. The road ran across the Hengduan Mountains and the Qinghai-Tibet Plateau — an area of the most complicated geological conditions and most diversified organisms. Besides its cultural and historic value, the road was also highly appreciated by adventurers and scientists. Bells were thought to ward against evil and were lucky charms. With shaman of the steppes having worn bells as part of their costumes, it would not have been hard to commission bells to be made specially for the precious horses. Some of the Japanese horse bells of the Kofun Period resemble the musical bells from the Zhou (bottom left photo) or Western Han Dynasty (bottom right photo Courtesy: Smithson Institution). From the Tang Dynasty (618-907), an important trade road, just as famous as the Silk Road was prosperous in southwestern China. Later to be known as the Tea-Horse Ancient Road, this road moved through Sichuan and Yunnan provinces and the Qinghai-Tibet Plateau Thousands of years of changes has resulted in the disappearance of the road. The exception is Lijiang Old Town, which was a vital commercial distributing center. The town including its original commercial pattern centering round the Square Street is in service to this day. Popular souvenirs include the Bunong Jixiang Bells and Naxi murals. Bunong Bells draw their inspiration from the bells of the horse caravans that once traveled the Tea-horse Ancient Road. Local handcrafts show the romantic horse caravan culture from years ago. The Jixiang Bell, known as the lucky bell, was a sacrificial utensil of the Naxi Group. The Naxi Mural is praised as the gem of Naxi culture reflecting the kind and intelligent aspect of Naxi people. A piece of Naxi mural, with its elaborate pictures and use of pastel colors provides a wonderful decorationt to family and friends…. Some researchers think that the Heavenly Horses were the descendants of horses brought by Alexander the Great into central Asia while Alexander’s horses were cross-bred from imported stocks. The King Philip of Macedonia had imported 20,000 Scythian mares  to cross breed the local stock of Thessaly. Then his son, Alexander the Great (356-323 BC), imported another herd of 50,000 Arabian horse from Persia. One of these cross-bred horses was the legendary Bucephalus, the mount of Alexander. The name of horse means ox head referring to the broad forehead and slightly concave profile The pictures below show a stocky breed for riding and a slender breed for chariots. The horses of the Amazon Archer and the Greek chariot both have a long shallow body, a long thin neck, and a small head. The pictures also show the straight mane on one of the four chariot horses and the Scythian horse. Yu CC et al., Genetic analyses of Xianbei populations about 1,500-1,800 years old Genetika. 2014 Mar;50(3):353-9.